Turtleship shaving has nice ones. They're more like pucks. They hold larger razors. Do you know the diameter you need? 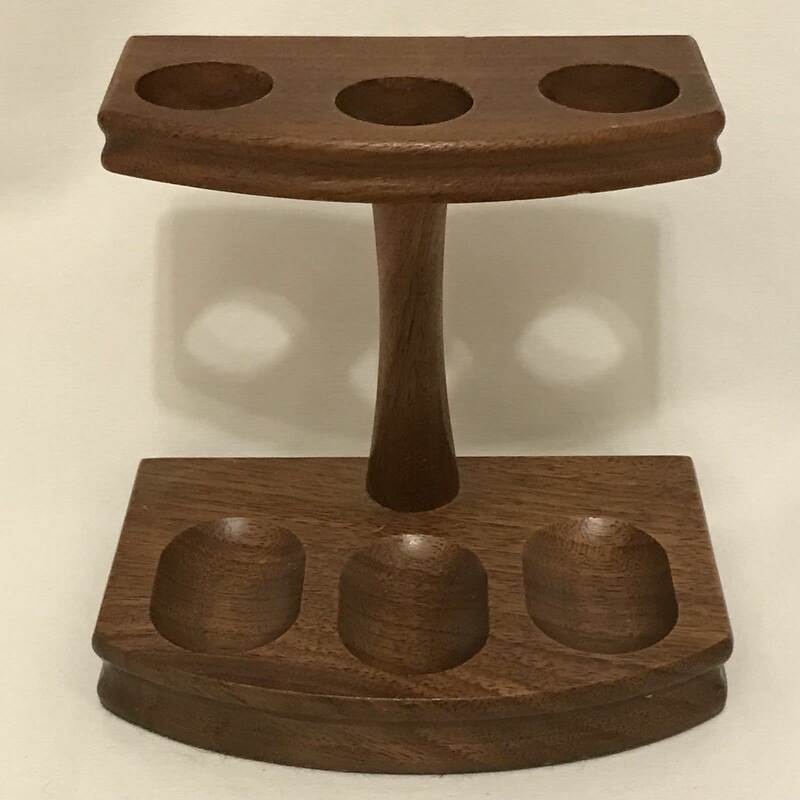 How about a pipe stand? You can find a variety of them for dirt cheap on EBAY. (11-20-2017, 09:11 PM)bullgoose Wrote: How about a pipe stand? You can find a variety of them for dirt cheap on EBAY. bakerbarber: Thickness on the handle looks to be a bit less than 3/4 of an inch. The pipe stand seems like a good way to go. There's room for more than 1 razor. 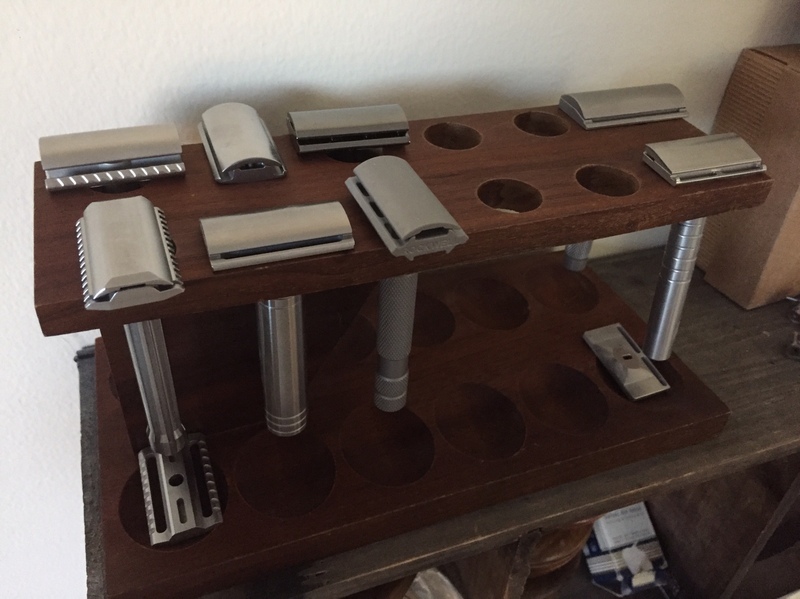 As mentioned before, TurtleShip makes a great $20 razor stand in various colors. Ideal fit for the bigger Wolfman Guerrilla handle. Website says razors is no larger than 5/8". Charcoal Goods makes a nice Brass razor sand for $40. 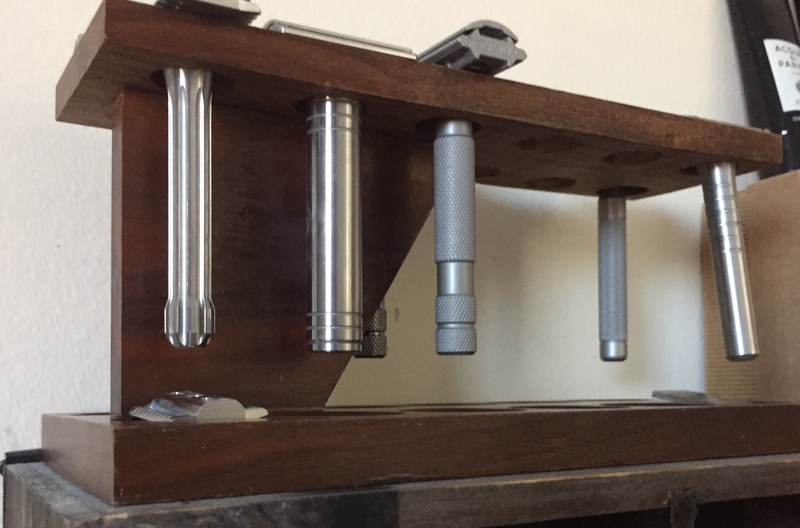 Stand uses a removable brass insert and fits the CG Magnum larger handle. (11-21-2017, 05:51 AM)DayMan Wrote: The pipe stand seems like a good way to go. There's room for more than 1 razor. 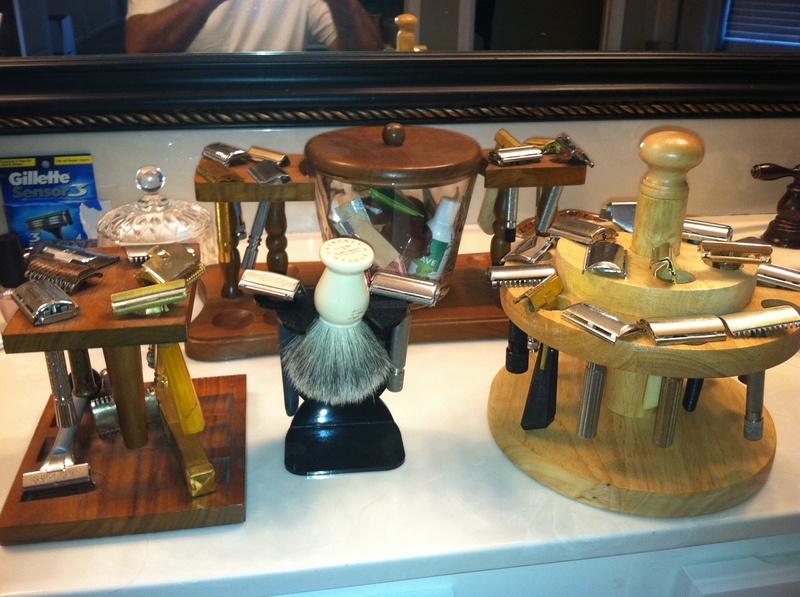 The pipe stand that I use at home holds 10 razors. They come in a variety of sizes. 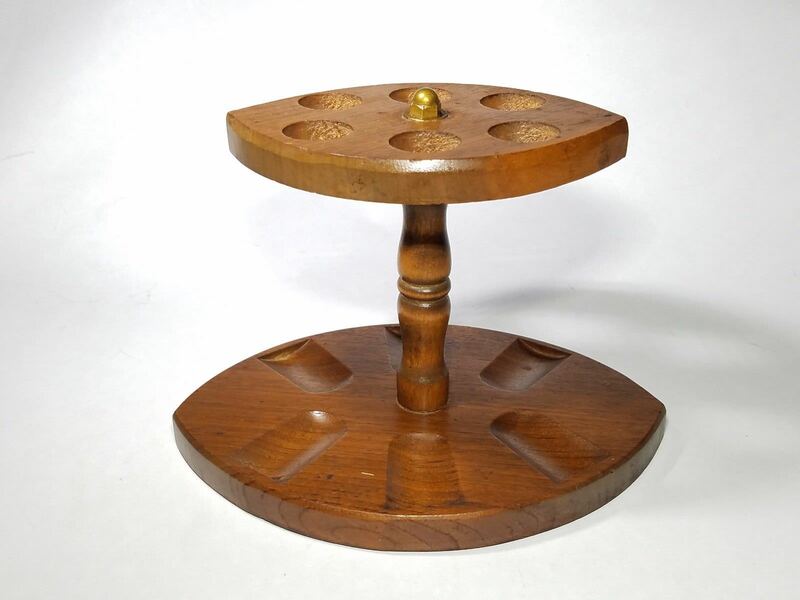 Another stand can be made with a 2 x 2 piece of wood or larger depending on space and drill proper size holes and then sand and stain to your taste. Bed Bath and Beyond sells a variety of toothbrush holders that double nicely as razor stands. They’re well within your price range. Tooth brush holder does work well the stainless looks nice too. Vapor stands (e cigarette) work well for razors. I like my clear acrylic multi-"razor" stand. Test tube holders probably would work. 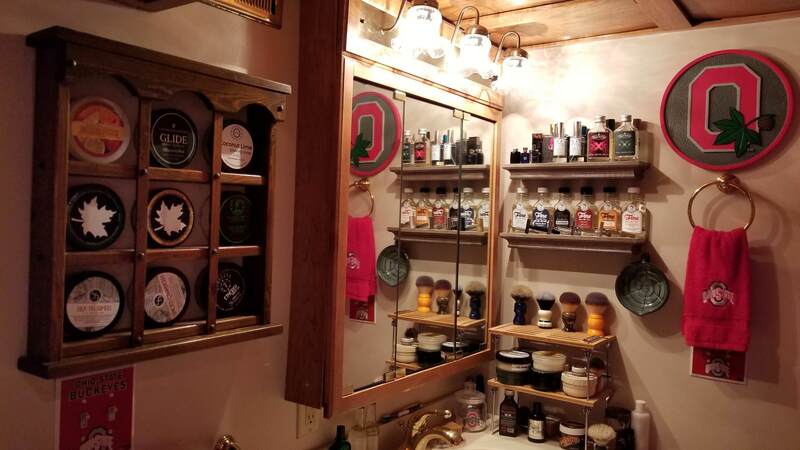 Numerous options and depends on # of razors and space. Thanks for the great idea Phil!! I got this in yesterday. Thank you, sir. Very pleased with it. Love the blackbird ! Wonderful shaver. Matt, I have one similar to yours and it's served me well for a long time. I think I picked it up on another BST. Yours looks great! (11-29-2017, 06:56 AM)TexBilly Wrote: Matt, I have one similar to yours and it's served me well for a long time. I think I picked it up on another BST. Yours looks great! Thanks, Billy! Would love to see a picture of your stand! (11-29-2017, 05:38 AM)Nh wet shaver Wrote: Love the blackbird ! Wonderful shaver. Yes, quite possibly the best! Rockwell and BB might be equally as good as each other in terms of shave quality. But add in the aesthetics of BB and it's the clear winner.